Welcome to our NEW mobile and tablet friendly site! We are starting to organize our events for 2019 and were hoping to go back to Amiens in France again last year to commemorate the end of WW1, but the costs of doing so for the numbers wanting to go was prohibitive. Instead, we are hoping to organize a special event for the Bands 10th Anniversary in 2019. We were very busy in 2016 having a go at competing for the first time in a few Minors and at “The Worlds”, plus the many local events as well as playing in France. We did not compete in 2017 as it proved too much for members to commit enough time to it, so our numbers were not consistently high enough to enter as many events as we would have liked to to make the experience worthwhile. But those that did take part gained the benefits that competing provides a focus point to help improve the overall quality and structure of our playing, broadening our appeal, helping to attract new members, some experienced and some wishing to learn and play with us, as well as giving existing members something new to aim at by becoming a part of “the band within the band”. We had a fantastic five day trip to take part in the two day event “Pipers for Peace” in Amiens, in the Picardy region of France, to take part in commemorations for the 100th Anniversary of the Battle of the Somme which started on the 1st July 1916. 22 Pipe bands took part in the events organised by the local Samarobriva Pipe Band. Samarobriva incidentally means “Somme bridge”. Prior to the events in Amiens, some 40 miles from where our band was staying in St Valery sur Somme, we looked around the local area for a local WW1 grave site where we could pay our respects. To our surprise and great interest, there was one just a few miles away, located at Noyelles-sur-Mer. This was the base depot of the Chinese Labour Corps in France, the site of their largest camp and of No.3 Labour (originally the Chinese) General Hospital. The Chinese Labour Corps was the outcome of an agreement made between the United Kingdom and Chinese Governments on 30 December 1916, for the employment of Chinese labour in France. The men were recruited in north China and the first contingent arrived in France in April 1917. By the end of 1917, 54,000 were in France and Belgium. At the Armistice the Corps numbered nearly 96,000 and even in May 1919, 80,000 were at work. Nearly 2,000 died during the war and when the cemeteries were constructed after the war was over, the headstones for these men were engraved in Chinese characters by a selected group of their comrades. There are now 841 First World War burials in the cemetery. The site is immaculately maintained and our PM and Juvenile PM played laments, followed by a laying of a wreath and our Branch Chairman quoted The Ode to Remembrance. It was a very moving experience for everyone. We, probably like you, had no knowledge that so many Chinese played such an important part of what was essentially a European war. Our last trip abroad was in 2014, which was a visit to New York to take part in the Tartan Week Parade and the very first New York Tattoo in fifty years – and one of only three pipe bands invited to take part and play along side the Grade 2 (and former Grade 3b world champions) New York Metro Pipe Band! Our very own PM opened the Tattoo by piping the Opening Remarks Speaker through the auditorium plus on and off the stage. The changes we made to our tuition and practice nights over recent years have had a very positive impact on our playing ability and our bands sound to achieve consistent, high quality performances, that are enjoyable for our audiences and for our performers. We will continue to encourage and support our younger members who wish to compete at Novice Juvenile and Juvenile Grades with the Preston Lodge High School Pipe Bands, and would hope that these talented young musicians will choose to join our competing band when they leave school. There will be no pressure on any members who decide the competition circuit is not for them and they can still be active playing band members for all our events as they are now. Now 10 years old in 2019, the band membership has grown from just a few to over sixty, with an age range of ten to almost eighty! There is also an army of unsung heroes, the parents, friends and helpers all working behind the scenes providing much needed assistance and encouragement as well as organizing fund raising and sponsorship. May 2016 – We have just been awarded “The Best Royal British Legion Pipe Band in Scotland” by RBLS. 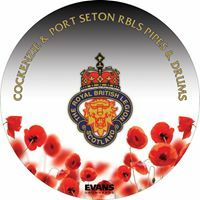 Cockenzie and Port Seton Royal British Legion Scotland Pipes and Drums is dedicated to maintaining the highest possible standards of musical and visual presentation in order to promote and enhance the public image of the RBLS. The band demonstrates commitment and pride within the local and wider communities by providing musical support for important events such as Remembrance Parades, Standard Dedications, plus many Community and Charity events around our county and further afield. We welcome beginners and experienced players. Our aim is to develop the musical and other relevant skills of all members by encouraging individuals to reach their full potential within the band. 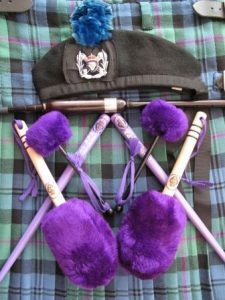 The band is under musical direction of Pipe Major Roderick Paton and chanter tuition is provided by James King. Drum tuition is provided by Andy Baillie and our Leading Drummer Gary Bourhill (snare drum) plus Alan Jordan (tenor and bass section). We conduct our finances on a non profit making basis, generating sufficient income from performances, donations and fund raising events to meet all operational costs, travel expenses and to make provision for future purchases plus repair and replacement of essential band equipment. We received a grant initially from Awards For All Scotland plus we received ongoing tuition assistance for a number of years from East Lothian Pipes & Drums Trust, now the Scottish Schools Pipes and Drums Trust. The tartan chosen for the band is Ancient Baird, which we dedicated in memory of the late Mr Robert Baird who served Cockenzie and Port Seton RBLS as Parade Master for over thirty years. We pledge ourselves to strive towards equal opportunities and welcome all members into the band with the hope that they too will enjoy the great experience of piping and drumming.